I have managed to acquire quite a few books in the last couple of weeks. Hmmm. Somehow that sounds a little vague as if the books just happened to me. Let's be blunt. I have bought quite a few books lately. 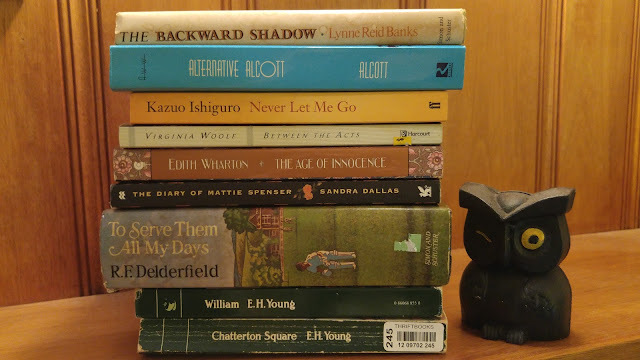 Most of them came from a library book sale and from Goodwill so they were very affordable but still, my shelves are starting to groan. In fact, my parents just bought me a new bookshelf for all the books stacked in front of the built-in ones in my living room. So, from top to bottom here is what I have. The Backward Shadow by Lynne Reid Banks. This is the sequel to The L-shaped Room which is the story of a young, unmarried, pregnant woman who moves into a boarding house in London after being turned out by her father. The Backward Shadow follows Jane as she lives in a cottage with her child and tries to make a future for the two of them. I read The L-shaped Room a few weeks ago and I thought the author made life in a London boarding house during the late 1950s come alive. Alternative Alcott by Louisa May Alcott. An anthology of some of Alcott's less famous works. Some I have read before, such as "Hospital Sketches", but some I am unfamiliar with, such as "Diana and Persis" which the blurb on the back says is her last unfinished novel. Never Let Me Go by Kazuo Ishiguro. It is described as the imagining of "the lives of a group of students growing up in a darkly skewed version of contemporary England." It was shortlisted for the Man Booker Prize. Between the Acts by Virginia Woolf. I have only read Mrs. Dalloway. I feel like I should read more Woolf. Isn't that what educated people do? The Age of Innocence by Edith Wharton. I think the only Wharton I have read is Ethan Frome. I read it in high school and I hated it. It made me mad. I didn't like the characters, I didn't like the affair they were having, and I got so angry when they drove their sled into a tree. (Sorry if you haven't read it and that spoils it for you.) I thought it was so selfish. I fumed about this book for days and got in an argument with my teacher about it. Since I was a painfully shy girl and very quiet in class you can see that I must have been pretty worked up about it. Recently I have been thinking that any author that can leave that big an impression on me must have something going for her so I am going to give Edith Wharton another try. Besides, it won the Pulitzer Prize. Apparently, this is also what educated people read. The Diary of Mattie Spenser by Sandra Dallas. Mattie marries Luke and they go off in a covered wagon to start a new life in Colorado. The book is written in the form of her diary. I like novels written as diaries, I like pioneer stories, I thought I might like this. To Serve Them All My Days by R.F. Delderfield. The story of a shell-shocked man who returns home from WWI and takes a temporary job as a teacher. He ends up teaching for several decades. I have read Delderfield's The Dreaming Suburb and The Avenue Goes to War and I enjoyed them. I like huge saga type novels that keep me busy for days. Chatterton Square by E.H. Young and William by E.H. Young. I really enjoy her novels. I wrote a review of one a few days ago. I just love her writing style. I am slowly buying all her novels. I hear good things about Miss Mole and will have to look for that one next. I actually ordered two more books online but they haven't come yet. Is there anything in my stack you really recommend? That is a lovely stack of books. Wasn't To Serve Them All My Days made into a mini-series? I seem to remember watching it on Masterpiece Theatre. I haven't read any of the other books in your stack. Is there one you're looking forward to reading first? I will have to look for that after I read the book. I think I am most excited about the E.H. Young books. She is my latest addiction. I enjoy the way she writes. She excels at the character driven, small town life book that addresses big questions in a subtle way. I always feel like the characters are saying so much more than the words on the page. I haven't read E.H. Young but I will keep an eye out for her! I LOVE your book haul. What luck to have such a good library and Goodwill next to you. Very interested to try EH Young. I'll be interested to see what you think of E.H. Young. I think she fits in with the type of books you seem to review on your blog. The only things I've read by Lynne Reid Banks were the "Indian in the Cupboard" books, which I ADORE.